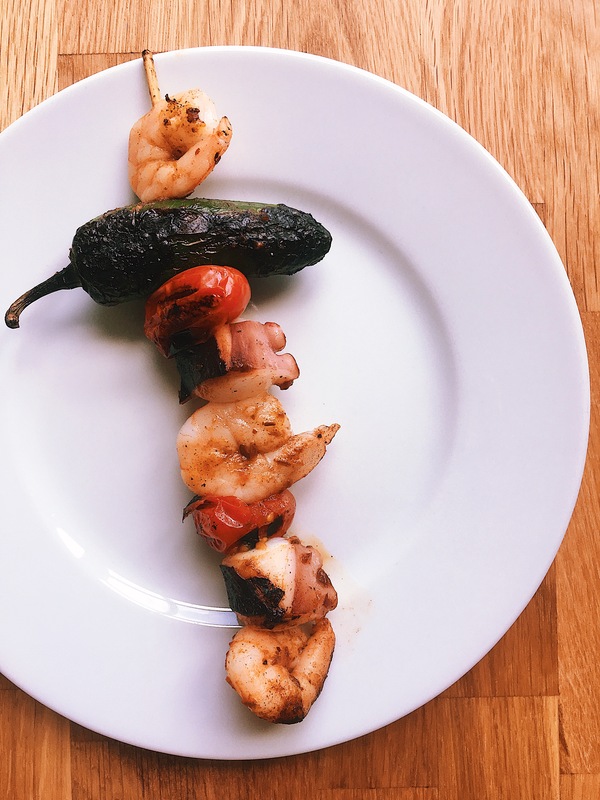 This weekend the weather in London is going to be brilliant, hot and sunny and on top of that it will be Father’s Day on Sunday, so if you are planning a BBQ to celebrate either the nice weather or Father’s Day here is a quick and delicious option to put in your BBQ, Octopus and Prawns Skewers rubbed with chipotle chilli. 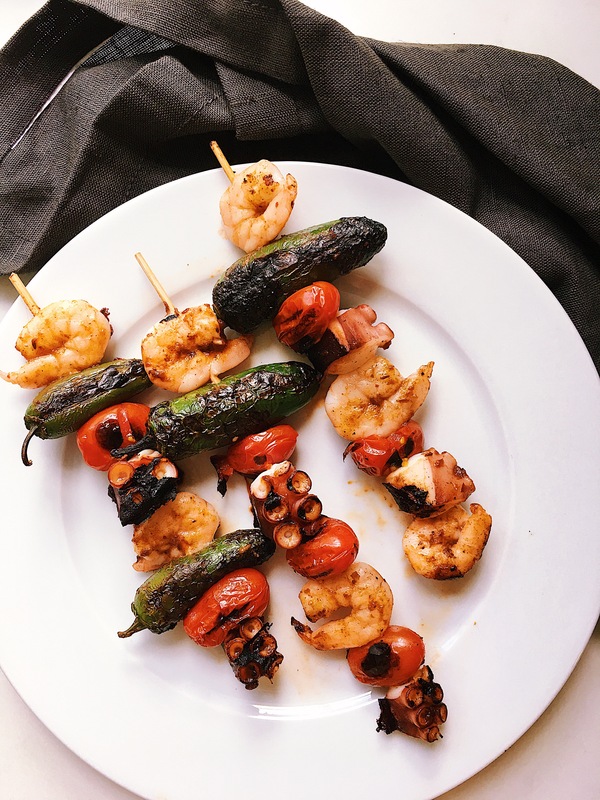 The good thing about this recipe is that you can put any veggies into the skewers, I put jalapeño chillies and cherry tomatoes, but feel free to add or change the veggies. The octopus legs & prawns I got them from my Japanese local store and the jalapeños I bought them in waitrose. First put the skewers wooden sticks in water so when they are on the BBQ, they do not burn. Then put the jalapeños & cherry tomatoes to char on a frying pan before insert them into the skewers. Once they are a bit charred, remove them and keep them aside to cool down. Then cut the cooked octopus legs into chunks. Have the chipotle sauce and a kitchen brush ready. Once all the ingredients are ready, start putting them on the skewers, prawn, tomato, octopus, jalapeño, prawn, tomato, octopus, tomato. When all the skewers are ready, brush them with the chipotle sauce and add a bit of salt to each one. Once the BBQ is ready, put the skewers on it, turning them making sure they do not burn. When the prawns turn pink, take them out of the BBQ. Enjoy them with a nice guacamole, tortilla chips and a cold beer. These look amazing Karla!! Definitely trying this recipe–we love octopus! Going to try the octopus ceviche too–yum! !